Seven Foot Knoll Lighthouse – Chesapeake Chapter U.S.L.H.S. Seven Foot Knoll Light was the second screwpile light to be built on the Chesapeake and the first to be built in Maryland. It is built entirely of iron and in a circular design, which is unique among the Bay’s screwpiles along with its barn red color. It was constructed in 1855 at the mouth of the Patapsco River and had a fourth order Fresnel lens. Ice flows threatened the lighthouse on several occasions but repairs were made as well as several shoring projects over the years. Thomas Steinhise, keeper, received a Congressional medal for heroism in 1933 after braving a storm in his small skiff to single-handedly rescue the crew of a foundering tugboat. The lighthouse was automated in 1948 and soon fell victim to severe corrosion and vandalism. In October 1987 ownership of the lighthouse was transferred to the city of Baltimore. It was moved by barge, in 1988, to Pier 5 at Inner Harbor waterfront where it stands on its own legs. It is the oldest surviving screwpile lighthouse and the only one of its design and is maintained by the Living Classrooms Foundation as a museum and learning center for Baltimore schools. 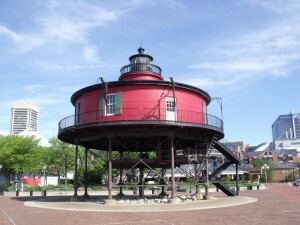 The Seaport of Baltimore has posted a history of the light station. The lighthouse is open daily, along with the lightship Chesapeake, spring to fall and Friday to Sunday in winter (museum admission fee).